On August 17, 2009, David H. Thorne was sworn in as Ambassador to Italy by Judge Arthur Gajarsa at theJohn Joseph Moakley U.S. Courthouse, Boston, MA. Following are the remarks of Ambassador Thorne. Thank you, Judge Gajarsa, for taking a pause from your vacation to swear me in. Ambassador Castellaneta, Consul General Stellino, Senator Kerry, Congressman Capuano, Mayor Menino, General Counsel Kerry, honored guests and dear friends. Thank you so much for coming here today to take part in this special occasion. I recently had the pleasure of visiting with Ambassador Castellaneta at the Embassy of Italy in Washington, and I look forward to many more conversations with our Italian friends. Honored guests and dear friends and family, from Boston and beyond, as I look around I see people who have shared my life’s journey. I know that I would not be here today without the blessing of your friendship. And, of course, I want to especially thank President Obama and Secretary Clinton for their confidence and support in me as Ambassador to Italy and the Republic of San Marino. But, in particular, I want to thank my friend John Kerry who I have known for over 45 years. I wouldn’t be here without you. He now wants to be known as Giovanni!! You are like a brother (sorry Cam, Diana- you have to share). Ours is a legendary friendship enduring through euphoria and defeat, war and peace, marriage and divorce, life and death. I am so grateful and honored to have travelled this road with you. It is indeed a karmic touch that today would have been my father’s 97th birthday – and fifty six years ago this summer he whisked his family away from their settled life in America to administer the Marshall Plan in Italy, which proved to be so important to that country’s revitalization after the devastation of World War II. So began my family’s special relationship with Italy, which became a second home to us - especially for me and my dear twin sister Julia, who I so wish could have shared this wonderful journey. And now it is my turn to whisk my family away to Italy. My family has always been the central pillar of my life. Rose, Will, Emma (and Brownie), you will all be an essential part of our mission to Rome and you will enhance the life of the Embassy immeasurably. I have been given one of life’s great honors - to represent the United States abroad as its Ambassador. This honor is made even more meaningful because of my personal connection to Italy and because of President Obama’s dedication to global outreach and cooperation with our partners and allies. Italy continues to be a steadfast friend and supporter of many of our foreign policy goals. While many European publics remain skeptical about the war in Afghanistan, Italian officials continue to convey the importance of Afghanistan to the security of not only Italy, but also the world. Italy remains strongly committed to the NATO mission in Afghanistan and to providing assistance to strengthen civil society in Pakistan. Italy is also a top-tier contributor to UN, NATO, and EU missions worldwide, and the United States appreciates Italy’s significant contributions to promoting security in Iraq and the Balkans. On the Israel-Palestinian question, Italy has fully supported a return to full U.S. engagement in the Middle East Peace Process. As current G8 President, Italy has helped focus world attention on critical issues like food security and climate change and brought the international community together in Aquila to coordinate a multinational approach to bring stability and security to both sides of the Afghanistan-Pakistan border. Italy has also provided key support for our military operations, hosting over 13,000 U.S. personnel at NATO military bases in Italy. We deeply appreciate Italy’s contributions to international security and will continue to rely on them as our partner and ally. The legacy of Italy in the United States is strong – Italian immigrants have brought a wonderful heritage of success here – Italian food, clothes, and innovative design have permeated our culture. Six million Americans visit Italy every year. This is extraordinary. But I am also committed to finding NEW ways to build upon this legacy and nurture a living, two-way dynamic partnership, “un rapporto vivo.” I want to ensure that Italy and the United States continue to work together to address the global challenges we face. I want to encourage more bilateral investment and foster greater entrepreneurial exchange between the business communities of our countries. I want to use public diplomacy and new media to build a more effective US Mission. It is my hope that efforts in these directions will reinforce and strengthen the bonds that already closely connect our countries. My family and I accept this great responsibility with enthusiasm, humility, and a deep love for the United States. 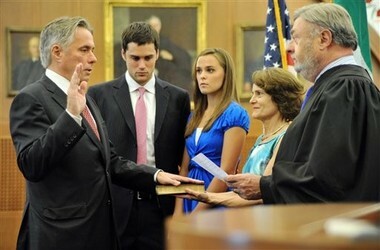 David Thorne, left, is sworn in as the new U.S. Ambassador to Italy at the Moakley Federal Courthouse in Boston, Monday, Aug. 17, 2009. Also seen, from second left, are, the ambassador's son Will Thorne, daughter Emma Thorne, wife, Rose Thorne, and federal judge Arthur Gajarsa. Thorne, former brother-in-law of Sen. John Kerry, D-Mass. was also Kerry's college roommate and Vietnam compatriot.